I have been photographing my coins for the past 4 or so years, and I have found that coin photography is a way to meld together two hobbies that I love. The first 2 to 2.5 years of the process were essentially experimental. I started with a Point and Shoot small Canon camera, and a couple desk lamps with incandescent bulbs. Early on, I also experimented with a light tent (also sometimes called a light box). I noticed improvement over the first 2 years, but I was still not happy with my final images after months of playing around. About 1.5 years ago I was fed up, and wanted to figure out how to get “professional quality” coin images, but didn’t really want to purchase a $1500 macro lens or a new camera. I stumbled upon a coin forum with its own “Coin Photography” sub-forum (this is quite rare among coin forums), and for the first 3-4 months I read every historical thread there related to set-ups, lighting, cameras, copy stands, etc. I finally jumped in and asked some questions, and soon thereafter I had a new way of imaging coins. I purchased a bellows and a couple enlarger lenses (about $90 and $40, respectively) and 3 little lamps from IKEA for $9.99 each (Jansjo lamps). I was seeing big strides in quality, and within 4 months of having this new set-up I was finally at a stage where I was happy with the images I was taking. Ironically, one of the most frustrating and difficult components of coin photography for me (and I think for others) was lighting. I say “ironically” because this also happened to be the least expensive ingredient of the recipe. In my many months of experimentation, I had been doing a lot of things that seemed “intuitive” but were actually the opposite of what I should have been doing. While there is no “magical” advice I can give, and there is no replacement for trial and error (i.e., thousands of practice coin shots), I hope this little bit of advice is at least helpful to a few. Firstly, I want to talk about diffusion of your light source. In essence, I encourage you to minimize diffused light or to avoid diffusion of your light source all together. Related to diffusion of light is the idea of “angle of light source” as compared to the coin. In the following schematic, I have defined the “angle of the lamp” with the pink arc on the left. One of the keys to decent coin images is to keep this angle of your light source as high as possible (as close to 90 degrees, and as close to your lens as you can get without throwing reflection on the slab or coin). As the angle of your light source decreases, the more “diffuse” your light appears on the coin surface. You can see in the following set of images how the angle changes the look of the coin. I have shown the left light source, right light source, and both together. This shows how the two light sources at the standard 10-2 positions work together to light the coin’s surface. Photographically, a lower angle of light source manifests as a decrease in contrast between high points and low points on the coin, and the overall image appears “flat” and usually lifeless. In terms of the levels histogram (pictured below), you can see that as the angle of the light source decreases, the histogram becomes more compact. In other words, the range between the lightest part of your image and the darkest part of your image decreases. As the angle of your light source increases, the range of lightest and darkest part of the image is much wider. The second part of lighting that I just want to touch on is the number of light sources. In all of the images above, I have used lights at the “standard” positions of 10 and 2 (this notation refers to the “clock positions” and is typical among photographers). Two light sources may not always be sufficient to fully light the coin’s surface. The coin I have depicted is about the size of a USA half dollar. You will note that there is a bit of a dark area at the bottom of the coin. In reality, when I am photographing coins larger than about the size of a USA quarter dollar, I generally use three light sources at positions 9-12-3. 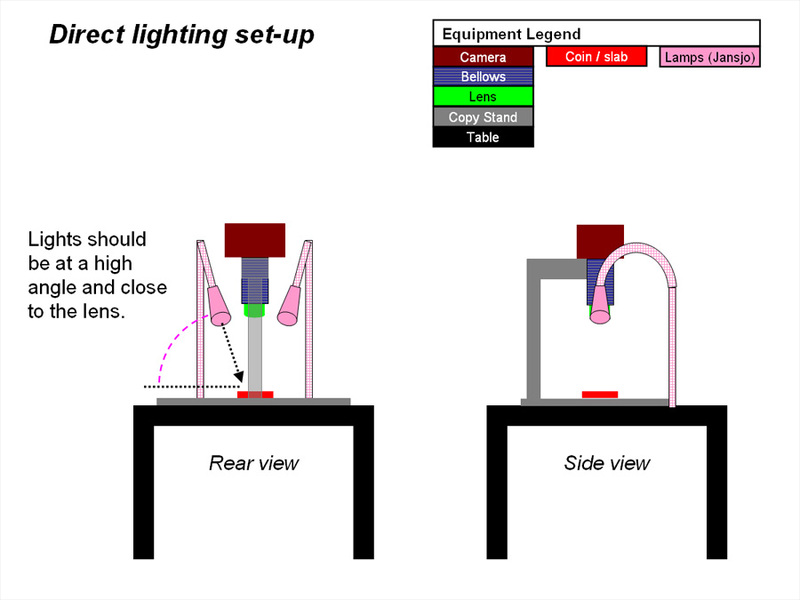 Some modification of these lighting positions may be necessary for coins with particularly high relief or with designs with devices that may look best if lit from behind or below. Below I show a schematic of the 10-2 and 9-12-13 lighting positions, and the same coin as above lit from a high angle with only 2 lights versus 3 lights. I hope these illustrations have helped to describe how the lighting angle and number of lights can affect the final image quality. I will just emphasize again, there is no substitute for practice. Over the past 4 years, I have taken more than 10,000 coin images and variables like the metal content (silver, gold, brass, copper, etc. ), the surface texture (matte, satin, lustrous, mirrored proof), and toning all modify the way I light a coin. Practice, practice, and practice some more. What is the Secret of 1864 Victoria Penny Bronze ?